UNICEF World Children’s Day campaign featuring Millie Bobby Brown, Orlando Bloom, Liam Neeson, Lilly Singh, Dua Lipa, and artists Blue Man Group urges everyone to #GoBlue. #GoBlue is an initiative undertaken by UNICEF and their ambassadors along with the people supporting it. The initiative is initiated with the motive of building a world where every child is safe, educated and fulfills their true potential. 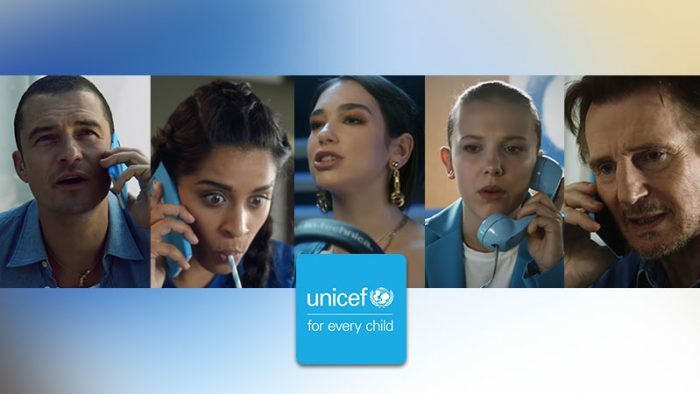 #GoBlue is live on all social media platforms along with the main video featuring Millie Bobby Blue, Blua Lipa and more; they have also released a series of short-videos illustrating hardships children have to go through. Global Citizens can do their bit to support the initiative by signing a petition to call on world leaders to commit to fulfilling the children rights. The whole & sole purpose of this campaign is to urge people all over the world to support this initiative. You can sign the petition here and also donate if you’d like to. Your favorite childhood memories might include watching TV with family, getting gifts on occasions, playing cricket or winning a dance competition in school. "It means on TV, I watch cartoons, instead of watching people die." We asked Ala'a, 12, from Yemen, what peace means to her. When few of these children grow up, their childhood memories would include being surrounded by bombs & missiles, being a refugee, not having enough water to wash hands, sitting on the muddy ground with not enough books at the place they call ‘school’. The war in Yemen is a war on children. These children when they should be enjoying childhood, are struggling to make ends meet. Celebrities along with participating in the video have also updated their Instagram profiles’ bio taking the initiative further at a personal level. BookMyShow's Sunday Movie Day: Standing for a cause still works?